After seven years, many dozens of repeal votes in Congress, and with the health of hundreds of millions of Americans at stake, can it be that the GOP’s plans to repeal the Affordable Care Act will come down to numbers? These are the estimates of the number of fewer Americans with health coverage, mostly due to insurance market changes with Obamacare’s repeal, and especially due to the removal of the individual mandate (the ACA requirement for coverage), according to the Congressional Budget Office. The CBO, federal lawmakers’ independent, nonpartisan budget researchers, issued its score of Trumpcare, even as Republicans tried to railroad their legislation through without it. The evidence-based CBO assessment rebukes the counterfactual GOP arguments about as powerfully as might be possible. The 2026 estimate of the total number of Americans, approximately 1 in 5 of us, without health insurance by 2026 under Trumpcare. 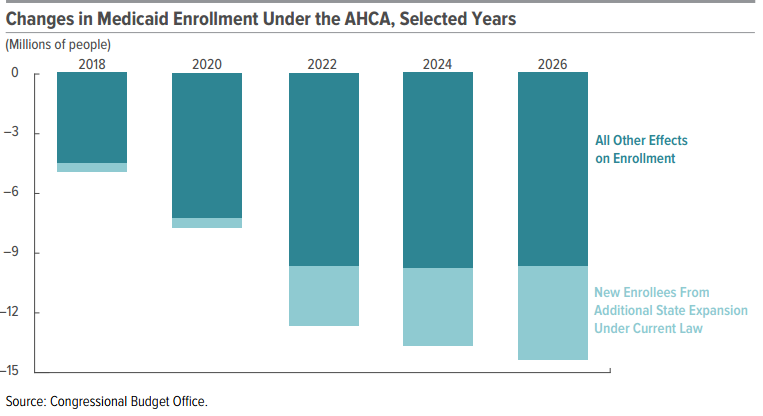 The higher number in the years ahead will be due to increasing Medicaid cuts and older Americans dropping or losing coverage (see the CBO chart on Medicaid’s plunging enrollments under the AHCA). This figure is just under twice what it would be under Obamacare (28 million) and only slightly more than the peak uninsured figure (50 million) hit during the Great Recession and before the ACA. This the amount Trumpcare would slash from Medicaid in the next decade or so, the chief government program to assist the poor, aged, disabled, and disadvantaged youngsters. Medicaid also is a huge boon to the middle class, as any Americans with elderly relatives in nursing homes or with kin with an array of disabilities, mental and physical, already know. Combined with GOP plans to end federal guarantees for Medicaid funding and to replace this with block grants that shove down to states the critical health care funding decisions, Trumpcare would make the most radical changes in Medicaid since its establishment a half century ago. The estimated tax cuts that the wealthy, Big Pharma, device makers and others will reap under Trumpcare, which would repeal a half dozen or so levies that had helped to pay for the ACA. These folks really need government help, right? The amount Trumpcare would cut in Americans’ tax assistance in the next decade for health insurance. Obamacare coverage subsidies were projected to cost $673 billion, while the CBO says the GOP s tax credits would cost $361 billion. ACA subsidies were based on income, aimed to increase the number of Americans with coverage, and sought heavily to assist the poor and seniors. AHCA credits are age based, benefit the young and healthy most, and, running between $2,000 and $4,000 per year per person, are much less generous than ACA subsidies. This is the CBO estimate of how much annually the ACA’s demise would reduce the federal deficit over the next decade. Consider this when Republicans hype a decade’s $337-billion deficit reduction via Trumpcare, and a $1.2 trillion cost-saving with Obamacare’s repeal-and-replacement: the United States is advancing with plans to spend $1 trillion in total to own and operate the benighted F-35, which will cost the nation $400 billion alone to buy 2,400-plus of the stealthy jets. This is the CBO estimate for what the average 64-year-old American who earns $26,500 annually would pay for health insurance if Obamacare’s gone. It’s more than half of the person’s annual income. And it compares with $1,700 now. How is that figured? Under the ACA, which limited how much more older versus younger Americans could be charged for health insurance, the lower-income 64-year-old individual pays $15,300, which is offset by a $13,600 tax credit. Under Trumpcare, insurers can charge older people more, raising the person’s premium to $19,500. But GOP tax credits would pay only $4,900. Trumpcare proponents like to ignore the CBO estimates that health insurance premiums overall would go up 15 percent to 20 percent in the next two years, preferring instead to note they are forecast to decline by 10 percent after 2026. It’s inconvenient to mention those declines would result from big market changes, with the overall insured pool cheaper to cover because so many poorer, older, and sicker Americans would be driven from it—they’d be uninsured or forced into high-risk pools that haven’t worked before. Advocates also claim that market competition will lead insurers to offer newer, cheaper policies—but they don’t mention these coverages only may increase the detested high deductibles, come with much skinnier protections that could be highly problematic if Americans get really sick. This is the estimated tax cut that the top .1 percent of Americans would see with the repeal of various taxes levied on high-earners to fund the ACA. The top 400 earners in the country—a group of individuals who average $300 million in annual income—would receive an average tax cut of $7 million each. The number of legs, prongs, phases, buckets—whatever they need to be labeled—that Republicans now say is vital to their assault on American health care. GOP leaders made the strategic decision, rooted for them in rare reality, that it would be too hard to repeal and replace Obamacare under regular congressional procedures. Instead, they have undertaken to do so via budget reconciliation, a process that, especially in the Senate, demands that they hew to sometimes arcane rules, most especially that any parts of the legislation under consideration must be budget related. Even as strife has broken out in their own ranks about what should or shouldn’t be in the current anti-ACA moves, GOP leaders have touted how Trumpcare, for example, will allow insurers to sell health coverage across state lines or let states experiment more with their Medicaid programs, including with harsh rules requiring recipients to work. But such steps aren’t explicitly budget related, and, so, may need to be addressed, separately from the ACA repeal and replacement, including by administrative actions by Tom Price, the Health and Human Services Department secretary. In Trumpcare parts II and III, GOP lawmakers also have advanced bills that would strip patients of legal protections if they are harmed while seeking medical services and that would give employers new powers though workplace wellness programs to compel workers to share private medical information, such as genetic test results. It’s unclear whether these later GOP proposals can get enough votes to become laws or to survive court tests. It’s clear that these hastily advanced, counterfactual measures will need major public scrutiny, as will the actions and conduct of the ethically challenged HHS secretary. Pro Publica, the Pulitzer Prize-winning investigative online site, reports that the U.S. Attorney in New York, recently fired by the Trump Administration after resisting a nationwide call for appointees from the previous regime to resign, had launched an investigation into Price. The Trump cabinet officer has been under fire for his stock trading during the time he was in Congress, when he has testified during his confirmation hearings that he had legislated over companies whose shares he was buying and selling. As Democrats have opposed Trumpcare for savaging Americans’ health care, GOP members of Congress have split among themselves whether their Obamacare repeal-and-replacement plans go too far or not far enough. The president and his men need 216 House votes, and a simple majority in the 100-member Senate. The 30 most extreme House GOP conservatives loathe the current plan because they say it is Obamacare lite, they want Medicaid eliminated, and they find the AHCA’s tax credits little different from ACA subsidies. The president and House Speaker Paul Ryan, who has been resistant to changes but has finally relented, may try to appease these dissenters by advancing the time when the huge cuts in Medicaid would occur, and by jawing, at least, about compelling more program recipients to work. But this may alienate 60 or so so-called “moderate” House Republicans. Some are in purple districts that voted for Hillary Clinton for president but still sent them to Washington. They may be representatives in states where tens of millions more got health coverage when Obamacare expanded Medicaid, and where at least four GOP governors have publicly opposed Trumpcare. Ryan and his aides have counted noses and think they can keep jamming Trumpcare through committees and to the House floor for a vote within days. But over in the Senate, Susan Collins has told a home state newspaper that she cannot vote for Trumpcare as it stands now; numerous other senators have expressed deep misgivings about the bill. It’s unclear whether speedy action can occur in the more deliberative Senate—and that poses big challenges for GOP leaders. They want action on the ACA by the April Easter break, in hopes then of turning to other GOP priorities, including work on the budget and tax code. Vox, the online news site, has put together a detailed analysis of Obamacare and what the GOP might have learned from it, especially in undertaking its repeal and replacement. The piece’s five central points are trenchant, and Americans will pay dearly that GOP leaders have been such thoughtless ideologues that these were ill considered in Trumpcare. As Vox points out, health care is extraordinarily complex and policy-making about it requires time, care, and intelligence because it is replete with painful tradeoffs. It works best if changes are made in bipartisan fashion, and politicians who fail to bring in as many parties as possible into discussions of change end up owning what can be considerable public anger. That’s because public benefits may be hard to grant but voters resent (and punish) those who even try to take them away—and those who tinker with health care get blamed for its every wrong. Vox also makes the point that the nongovernment parties in the sector, including giant hospitals, major insurers, large hospitals, Big Pharma, and moneyed medical device makers can be difficult and unreliable political partners. “I want everyone to know I’m 100 percent behind” the American Health Care Act, President Trump said. “The press has not been speaking properly about how great this is going to be. I watch, I say, ‘That’s not the bill we’re passing.’ “ As columnist Ezra Klein asks on Vox, the online information site, does the president know what’s really in the AHCA? Does he understand it does nothing that he says it will? Does he realize how it hurts most the people who put him in office? The president and the GOP-controlled Congress are on the brink of breaking the ACA, without putting up anything that’s less than a legislative dumpster fire. With our health and well-being so much at risk, we need to do everything that we can to ensure they do much better—and to keep exercising our democratic rights to let our elected officials know what a terrible course they’re on now.